Never has the threat of world war been more imminent than right now. Most of the world's infrastructure continues to rely on outdated technology powered by oil and gas. History proves no country is immune to the devastating effects war has on currency reevaluation. This makes hard assets highly desirable - gold and oil being the two most coveted. more demand means more liquid (easier to trade). Take into account the widespread demand, as well as the scarcity of these commodities - and you have the perfect storm. The average corporate tax rate among 20 competing markets is under 20%, but in the United States this number is 35%. 1) the federal government would take in more tax revenue without having to raise the rate on remaining companies. 2) becomes more attractive to foreign entities interested in relocating their legal domicile to a more tax friendly jurisdiction. Because America is such a large market with many net benefits this should be considered the limiting factor and thus consequential. Between 1986 and 2016 the number of US companies ranking among the world's top 500 by revenue fell from 218 to 128. To maintain tax revenue, the country has had to raise the rate on the remaining companies - this hasn't helped the situation which has gotten out of control : $300 billion worth of companies taken over in 2016 highest in almost two decades. since when does a bankrupt nation have the luxury of choosing expensive energy? Clinton wants to add trillions more in debt to build the infrastructure needed to produce energy at a rate of 80+ cents per kwh when coal and gas is only 25 cents. The transition to alternative forms is the reason Nova Scotia has the highest utility rates in Canada. 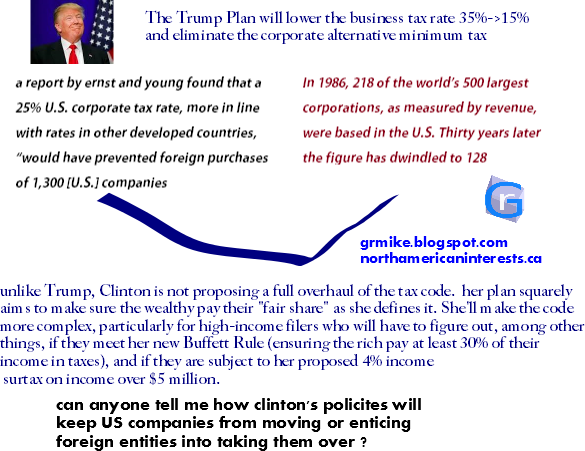 The Trump Plan will lower the business tax rate 35%->15% and eliminate the corporate alternative minimum tax. unlike Trump, Clinton is not proposing a full overhaul of the tax code. her plan is intended to make sure the wealthy pay their "fair share" in income tax. Under her the code more complex, particularly for high-income earners who might or might not meet the Buffett Rule (every individual and company making more than $250 thousand have to pay a minimum of 30%); they could also be subject to her proposed 4% income surtax on income over $5 million. According to a spokesperson at Canada's largest bank RBC, the current gold price has no legitimate support because they say, it stems from record breaking investor demand in gold ETF 's and a reshuffling of asset positions at Comex. It sounds as if even the bank's are running low on excuses to justify their bearish positions on gold - They say that without a new risk off event the price should fall back to a long term outlook level of around $1240. Seraphim's opinion - You want risks ? You got'em ! How about a 180 degree change in the relationship with Russia ? or an admittance that the United States is fighting an entirely different war in the middle east than what's been publicly declared ? or how about a new trade war with China ? This is just the tip of the iceberg of what awaits the US in the coming year if Donald Trump becomes president as the polls have already tipped in his favor. At a time when investor confidence is not just low but non-existent, money printing continues unabated, and the US dollar remains overvalued (even if just because every other currency is being devalued so as to boost gdp) 2017 is on track to be the riskiest year of the millennium. Historically, gold's role proved to be irreplaceable - in protecting national economic security during times of financial crisis, geopolitical crisis, currency crisis. China has long sought to replace the dollar in foreign transactions with its own currency, and that started happening this year - even Canada is on board with its own Yuan clearing bank set up in Toronto. The ultimate goal however is to usurp the dollar's position in global finance. The only time that could happen is during a time of collapse in currency markets - even if it is just temporary gold will become the default currency of choice. If China is the only country capable of supporting its currency with gold (aka the yuan renminbi is gold backed) then the yuan will have won ! 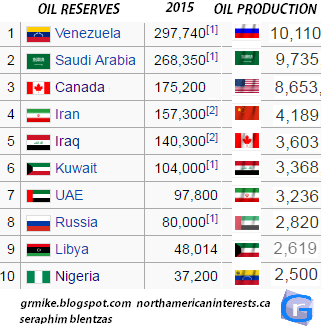 Oil and Gas - Despite what many western governments and environmentalists are saying, the world has not moved away from oil. While it is true that many modern vehicles are equipped with hybrid fuel technology, they still depend on gasoline for 80-90% of their fuel needs. Virtually every home built twenty or more years ago is heated with oil and the cost to change that is high making the change to electricity an additional expense most homeowners simply cannot handle in a depressed economy. Additionally the more popular modern power generators are only fueled by oil and gas. Gold - The yellow metal holds a unique status in everything from religion to jewelry to wealth storage. Even central banks and world governments look to gold as an inflation hedge and trade gold in times of economic trouble (2016 - Venezuela); no other metal enjoys this distinction not even platinum and there's no reason to think that will change anytime soon. The last time fiat currency wasn't being used world trade relied fundamentally on the gold standard. 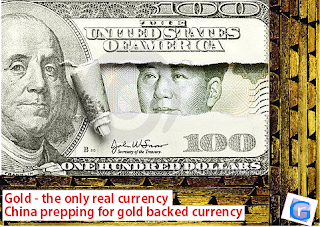 With the US dollar losing popularity as the world reserve currency and China looking to gold to prop up its own currency it appears as if the gold standard will once again run the world economic system. With the world economy slumping along there is no reason to expect people to voluntarily shift to expensive sources of energy anytime soon. Even the cheapest of these - energy derived from corn (corn demand, ethanol) in South America - is already wreaking havoc on commodity prices in that part of the world because it takes too much of the crop to replace just a fraction of the energy it needs. What's different about this commodities rally is that it's not just the gold price that's up - gold equities and mining stocks in general are starting to exhibit overall growth, even the ones with known risks kinross, anglogold ashanti. A deteriorating relationship with Saudi Arabia means we might be witnessing the last days of the 'Petro Dollar' - at best this translates into even less support for US dollar denominated trade. Don't limit your purchases to just one company spread it around but do favor companies that already have the infrastructure in place to produce gold since it can take a long time to develop a mine. Focus in on companies that weathered the storm and didn't resort to closing mines - in the short run they will yield the best returns. The gold silver ratio exceeded 80 for much of the last year but now with a new commodity bull run starting to take place, the ratio has already declined to 70. Considering the recent past (10-15 years) the ratio has the potential to decline even further to below 40, leaving the possibility of a 2 to 1 return on silver verses gold. Demand for silver remains strong but remember that central banks don't buy it - this means that global economic instability is less likely to benefit silver price and more likely to benefit the price of gold. In the meantime make silver mining companies a priority. Kinross Gold NYSE:KGC - has most to benefit from a new gold rally. kept mines despite downturn in stock in recent years - weathered the storm. iamgold NYSE:IAG - stock suffered more than competitors last five years down 85%. key mines remain operational and showing robust growth. Seabridge Gold NYSE:SA - 40 million ounces gold 300 million ounces silver and that's just 2P proven reserves. any news regarding mine development will double the stock price overnight. Although the specifics regarding Valeant's problems won't be aired out until the company releases it's 10-k annual report in April of 2016, it's safe to say the stock has borne the full brunt of investor scrutiny (high institutional ownership has been a factor). The biggest risks here on out are revenue growth, write-offs, and lawsuits - but even in a worst case scenario there is no way these three will severely impair earnings for two or more quarters. Valeant continues to own a number of game changing drugs and products - a non-ownership relationship with Philidor doesn't change that ! revenue stream remains strong this will be key in keeping operating costs per unit within reasonable levels. - global exposure - problems in the USA do not affect Valeant's ability to affect/control prices in other countries. The large quarterly write-off related to the Safeway assets should be seen as a one time occurrence; the affect on future earnings is being exaggerated. This makes it a stock to watch in the second half of the year. A recovery in the price of oil (will average $45 this year and $72 in 2017) will be a boost to Alberta's economy - big Canadian companies have been able to withstand volatility more than shale companies south of the border/rig count down in USA = less oil glut in North America = more opportunity for Canadian oil price to close gap with WTI. 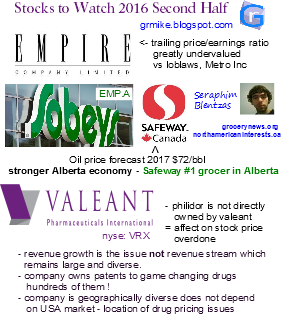 Since acquiring Safeway, Sobeys has been the number one grocery chain in Alberta. For the first three months of 2016 calendar year same store sales +0.4% chain-wide despite being up +2.7% in its base of eastern Canada. 2016 has thus far been an extremely volatile time for Alberta's economy (keystone pipeline rejection/oil price dropped to historic low/oil companies slashed capital spending); it is likely that the situation will improve later on this year and into next year. price/earnings ratio greatly undervalued versus alternative stocks Loblaw Companies, Metro Inc.
book value per share is at a discount. so expect these write-downs to become smaller over the next 1-2 years which will allow the bank to return to profitability - and perhaps even start paying a dividend. Risk is not a major factor - the bank is 73% backed by the British government. Seraphim Blentzas. Simple theme. Powered by Blogger.